Someone forgot to cover the arilbred, oncocylus and juno irises last night and it poured with rain! Fortunately the sun is shining now and the growing medium is incredibly free-draining so hopefully this won't start them into a premature burst of growth. I have four arilbreds, three named and one seedling they chucked in as a free gift (that's the big fella at the front who I suspect has already come out of dormancy cos there's roots sticking out the bottom of the pot! Whether I ever get to see any of the above in Spring is uncertain now but at least the mixed candelabra Primula species I pricked out yesterday were at home in the monsoon and seem to have suffered no setback. I'm glad I went for it, there are still plenty of smaller seedlings left in the tray but these look quite happy. Click to enlarge, or just look below! 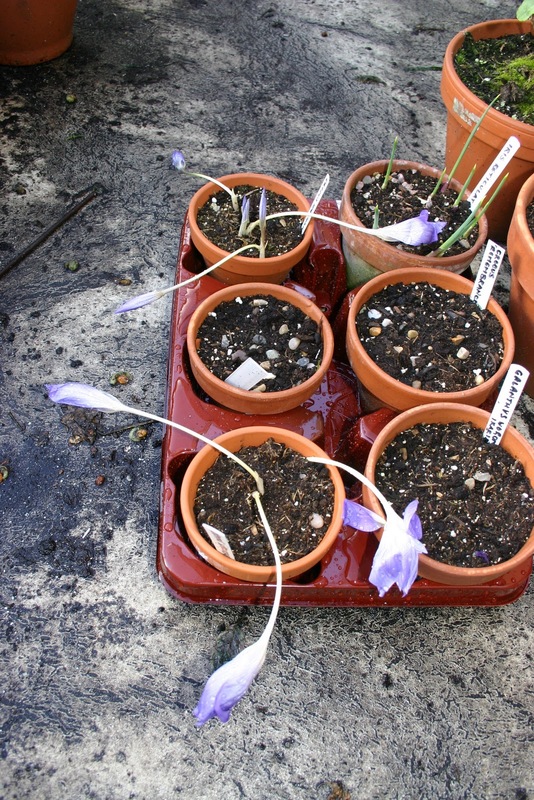 But there is some great news: the Iris douglasiana hybrid seeds, which have sat quietly for the last few months doing nothing, all suddenly decided to make a bolt for the sun on the same day! The 2litre pot went from brown to pincushioned with green in 24 hours. It's like they'd all suddenly said "This is boring, let's grow". Many of the seeds had been washed to the surface and were sitting with roots going one way (the right way, fortunately) and shoots upwards. So I decided to cover it with a 1cm layer of vermiculite to help them along, hence no photo, so here are some mixed lilies instead! I've counted 21 now. Brilliant. God knows where I'm going to grow them to flowering size but I'm just so chuffed with the whole project I'm putting that to one side for the moment. Coming back to Irises (I always do), the Sibirica hybrids may only number six but they look chunky enough to make it through the coming months. 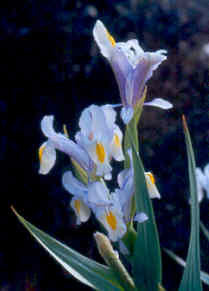 Iris Douglasiana: the hybrids will all be variants on this theme, some darker blue, some veined, possibly more yellow, taller, shorter. A veritable smorgasbord of Pacific Coast radiance! So, the Digitalis ferruginer var. gingantea seedlings I pricked out a few weeks back are thriving, the Digitalis oscura are kind of in stasis at the seed leaf stage, the un-named South African Pelargoniums are coming along nicely and the meconopsis regia and betonicifolia seedlings are just going to have to take their chance in the cold frame, when it arrives. I ordered a M. napaulensis plant which is in the same rossette group as regia but likely to have red flowers (or yelow, or blue) so I'll have something. 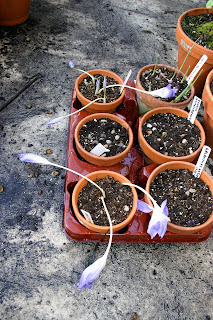 And if they let me down I've got some secret Meconopsis integrifolia seedlings up my sleeve! And that's Digitalis ferruginea below looking perky. An unidentified South African pelargonium seedling. It's unlikely to be a thing of great beauty (having looked at pictured of the species list provided by Chiltern Seeds of which this is one, just not sure which, I have a huge respect for the hybridisers of our modern-day window box staples! Short one today as i have a meeting shortly (on my day off!) and now that I'm back at work updates may be more sporadic but remember, it's quality, not quantity that counts!